This article by Harry Browne is re-posted from CounterPunch. It had been just about possible to ignore Bono’s TED talk about the imminent eradication of extreme poverty, delivered in California a few weeks ago. Ignore it, that is, despite the heavy worldwide media coverage and all the tweeting and retweeting by the likes of Bill and Melinda Gates, the Irishman’s chief patrons. But then he turned up making many of the same points on Irish national radio, spoiling a perfectly good (cold, damp) St Patrick’s weekend, in an interview that was fawning even by the elevated standards to which Bono is accustomed. Interviewer Aine Lawlor, a respected radio journalist, actually finished the stultifying 16 minutes by saying to Bono, “Thank you, love”. Bono, who is accelerating humanity toward the end of its long anti-poverty journey, allegedly loves data. He called his first lobbying organisation DATA (Debt Aids Trade Africa), and told the appreciative California audience that he’s a “factivist” who gets sexually aroused by numbers. 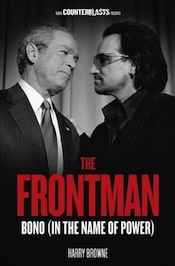 But Bono’s “inner nerd” really needs to meet my outer skeptic, because in fact his optimistic message about the trajectory of poverty eradication, and the reasons for it, is a flimsy tissue of truths, half-truths and statistics, conveniently skewed to suggest that he and his Western partners in Africa (governments, corporations, foundations) have been doing a great job entirely. About those statistics: most of them are compiled by the World Bank, which can scarcely be regarded as a neutral arbiter of the question of how its programme of neoliberalism has been treating the world’s people. And even assuming the best will in the world, the stats are, in the words of Prof William Easterly, “based on a firm foundation of wet sand”. For the purposes of assessing Bono’s claims, however, let’s momentarily share his assumption that the World Bank number-crunchers have given us something accurate and meaningful, that we can say with some certainty that, for example, the global percentage of people in “extreme poverty”, defined as living on less than $1.25 each per day, roughly halved from 1990 to 2010, to about 21%. That’s a rate of decline that would get the percentage down, as all the Bono-inspired headlines claimed, to zero by about 2030. But does that claim make any sense when you take a closer look? Do the statistics Bono presented, and others besides, really tell the story of a millennia-old anti-poverty project nearing its end, as he tried to lay it out in his self-congratulatory 12-minute talk? On the contrary: while some of the news is genuinely good, and some of the rhetoric superficially uplifting, Bono’s message is flawed (to put it too politely) on a number of crucial grounds. In a rhetorical tactic of stunning cynicism, Bono frames his talk by suggesting that what he’s presenting has something to do with the principle of human equality. That idea, he says, began 3,000 years ago in Egypt (“civilisation just getting started on the banks of the Nile”) when Jewish slaves told Pharoah that “our holy book” said they were his equal (we await chapter and verse on that); and then the idea returned to Egypt in 2011, he said, via another book (heh-heh), Facebook. Bono, a well-known investor in the social-media website, doesn’t explain how software that counts the number of your friends, that constantly devises and adjusts algorithms to determine who is more important, and that now charges money to “promote” your posts is a veritable Bible of Egalitarianism, but there you are. It’s not just Bono’s own unimaginable riches and his dubious versions of ancient and recent history that make his “equality” talk so sickeningly misdirected. It’s that, whatever the precise facts about extreme-poverty reduction, we know for certain that the recent history of the world is a story of dramatically increasing inequality. Four out of five people live in countries that are becoming more unequal in terms of income. For Bono, “equality” is just another feel-good word, a warm set of syllables to be deployed even to describe its exact opposite. Although he offers a caveat about maintaining anti-poverty “momentum”, Bono clearly suggests that bringing extreme poverty to zero is just a matter of keeping up the good work to maintain the trend. We’ll look below at some of the other flaws in this reasoning, but for a start it is simply a dumb, wishful deployment of statistical trend-reading about something with such complex manifestations and causes as extreme poverty. In fact, there are indications in the data that the rate of decrease of extreme poverty may well be slowing – not surprisingly, given the crises in global finance and food that have shaken so many countries in recent years. Bono’s 2010 figure is probably on even wetter sand than the ones that precede it: the World Bank itself still only presents a full set of data up to 2008, before those crises had fully taken hold, and last year said its 2010 numbers were “preliminary”. while admitting that “the food, fuel and financial crises over the past four years had at times sharp negative impacts on vulnerable populations”. Okay, like the Good Lord says, the poor we have always with us, but does it make any sense to treat a two-decade decline as the culmination of a millennia-long battle against poverty? Have we simply been witnessing a period of some slightly benign statistical adjustment after the worst excesses of imperialism and neoliberalism beggared half the world? Were more than 40 per cent of the world’s population “extremely poor” by some sensible measure in the time of the Pharoahs? Of Jesus? Of the conquistadores? The World Bank can’t tell us that. Bono’s economic guru, Jeffrey Sachs, has written that “a few generations ago, almost everybody was poor”. But that’s ahistorical, at best, because the term “poor” there only makes sense when set against later standards of living. Is it really poverty if “almost everybody” shares it? “Extreme poverty” as a concept surely exists partly because we can set it against the extreme wealth of the man on a stage in California presenting a high-tech talk about it. Which brings us back to inequality. As Philippe Diaz’s superb film The End of Poverty? tells us, in 1820, the per capita wealth gap between the poorest and richest countries was three to one; in 1950 it was 35 to one; in 1997 it was 74 to one. You don’t have to romanticise the pre-colonial lives of the world’s subsistence majority to recognise that those two centuries witnessed a monstrously accelerated appropriation of their resources, and disruption of their lives. Today’s aid to the “developing” world represents the tiniest fractional giving-back of what continues to be taken. When Bono trumpets the global fall in poverty, he declares, “we know what works”. As he spells it out, it is exactly the program that he and others in the West have promoted over the last decade or two, and he lists elements of it: aid, good governance, and foreign direct investment (he rarely mentions the trade liberalisation and privatisations that facilitate FDI) . No one could possibly mistake Bono’s TED talk for anything other than a claiming of the credit for the improvement he cites. In fact, how about this for an ugly statistical comparison for Bono et al: in 1981, 10.5% of the world’s extremely poor lived in sub-Saharan Africa; in 2008, that number was 30%. If you were going to look for evidence that one or another approach to eradicating poverty was “working”, would you look to Bono’s Africa, or would you look to East Asia and the Pacific, where the number of extremely poor fell by almost three-quarters between 1981 and 2008? Or to Latin America and the Caribbean, where the number fell, incredibly, by more than 40% just between 2002 and 2008? Might that, just possibly, have something to do with countries resisting the Washington/Bono Consensus, rather than going along with it? In sub-Saharan Africa, where Bono’s agenda has been concentrated, the absolute numbers below every poverty threshold have skyrocked since 1981, with the number of extremely poor rising from 205 million to 386 million in 2008; at the below-two-dollar-a-day threshold the sub-Saharan numbers have almost doubled in the same period, to 562.3 million. This is in the context of a large population rise, of course: the percentages of the population in these poverty categories have risen and fallen in the sub-Saharan region – much of the 1990s and early 2000s seems to have been particularly catastrophic there – and those percentages are more or less to back where they started in 1981. So much for “momentum”. Globally, and again assuming accurate and meaningful data, it is true that there has been a half-billion-plus decline in the number of extremely poor people. But it’s clear that those people have remained very poor indeed. As the World Bank acknowledges: “There has been less long-run progress in getting over the $2 per day hurdle.” The number of people in this category remains, after three decades, around 2.5 billion. Slide the threshold slowly upwards and you very quickly embrace the majority of the world’s people – 80%, for example, living on less than $10 a day. And even the slight upward movement at the bottom may not tell us very much about how people live, since recent decades have seen massive population displacements from rural areas into urban slums, where you might be be a lot hungrier on the notional $2 a day than you were on half that money in the countryside. You might imagine someone from Ireland, where the Celtic Tiger has been well and truly eviscerated and whose head is now just another trophy above the mantlepiece of financial capitalism, would be cautious about making great claims based on rapid economic growth in a particular set of countries. Not Bono. As far as he is concerned, the apparent success of some sub-Saharan countries (the “Pride of Lions”, cherrypicked for their good data from an otherwise disastrous region) represents his vindication. Never mind that a report just last year from the UN Conference on Trade and Development, another body that might be expected to try to put the best face on such matters, declared that “the current pattern of growth is neither inclusive nor sustainable” – that the growth is, in short, unequally shared and largely fuelled by the extraction of quickly depleting natural resources. There are all sorts of reasons, positive and negative, why global poverty statistics have been changing. Rapid growth in Asia, increased integration of the world’s economy, intensive environmentally unfriendly resource extraction, urbanisation and the creation of NGO-led aid-dependencies in various poor countries are all likely to have an effect on the data. So indeed will a set of Latin American governments that actually are oriented toward the poor. And lest there be any doubt: there is some good news indeed in Bono’s statistics, with especially welcome changes in terms of children’s health outcomes, thanks in part to effective, albeit hugely insufficient interventions against malaria and AIDS. There are other good numbers that Bono doesn’t cite. The ones, for example, that show a continuing slow rise of per capita calorie intake all over the world – not just in the increasingly obese West – is throwing another generation of Malthusian calculations into the waste-basket (though again the sub-Saharan Africa numbers have not been especially pretty). Despite the Gates/Bono push for more high-tech, foreign-owned agriculture in Africa, the hungry world evidently has a distribution problem, not a production problem. Like so much of his work, Bono’s idea of “good news” is a distraction, deliberate or otherwise, from the sort of radical redistribution of resources that would lead us toward a world where equality, justice and the genuine eradication of poverty were really imminent possibilities.